[By Nick] Okay, time for a quick review of a bar I picked up at a gas station not too long ago. I was craving chocolate and when I saw this bar I knew what I was picking up. That was actually the first time I’ve seen a Haagen-Dazs chocolate dark chocolate bar in person. I know they’re carried in packs of 3 in grocery stores but the ones around me only carry the vanilla versions. 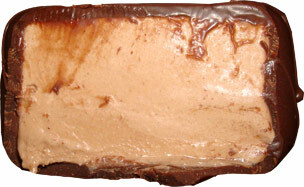 The box says that this bar is “chocolate ice cream dipped in, then drizzled with fine dark chocolate”. Seems pretty straight forward but Haagen-Dazs does do a better job at hyping this one up on their website. The site states that “between the classic rich and creamy chocolate ice cream inside, and the thick and crunchy dark chocolate coating finely drizzled on the outside, this is a chocolate connoisseur's delight.” See that descriptions sounds way more enticing. While I wouldn’t call myself a chocolate connoisseur, I do enjoy a quality chocolate from time to time. Side note: Am I the only one who is bugged by the name of this product? I know they have a vanilla bar named “vanilla dark chocolate” but in my mind I feel like the name of the shell should come before the name of the ice cream. Eh I’m just weird I guess. Taking this one out of the box, you’re greeted by the Haagen-Dazs classic Haagen-Dazs label pattern. I still have no idea what this pattern is supposed to be or what it’s supposed to represent but its eye catching nonetheless. Now getting through the wrapper, we’re finally to the good stuff. 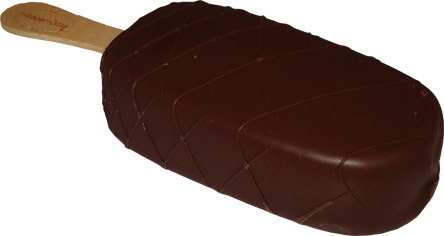 The bar is standard size for a premium ice cream bar. I’d say is about the size of a dove bar but not quite as big as a Magnum Bar. It does look pretty tasty though. I think it’s time I try this baby out. After taking my first bite I was hooked. This took my beloved double chocolate Klondike bar and upped it a few levels. The chocolate ice cream is pretty much what you’d expect out of Haagen-Dazs. It lives up to the description of being rich and creamy. It’s something that you want to take your time with and enjoy. What I liked most about this bar was its dark chocolate coating. While not as thick as say a Magnum Bar, it still manages to pack a lot of flavor. The dark chocolate is just how I like it, full bodied with just the right amount of bitterness. I also like the fact that it’s actually dark chocolate and not a dark chocolate flavored coating. The ice cream and the shell just work in perfect harmony with both of them not overpowering the other. All and all this was a nice find and I’m glad I picked it up. Now if only I could find a store that carries these in 3 packs so I wouldn’t have to spend almost $3 for a single bar. Curse you gas stations and your ridiculous prices. Molly, I felt the same way but I thought it was kind of like a cheetah print as well. What happened to the Vanilla and Dark Chocolate Bars? @Anon: Looking over their website, it looks as if they were discontinued. Have you tried the Magnum dark chocolate bars? I have a review for them coming up in the near future! Crazy that Haagen Daz would discontinue making vanilla ice cream dipped in dark chocolate since dark chocolate is all the rage now! Milk chocolate and vanilla ice cream just doesn't have the same great taste!